A day after Amazon’s surprise announcement regarding a proposed new business tax for homelessness services, flare-ups of opposition show deep frustration with Seattle’s handling of the crisis. Reaction to a proposed Seattle business tax for housing and homeless services jolted elected officials this week as flare-ups of opposition revealed deep frustration with the city’s handling of its homelessness crisis. If Seattle City Council members were surprised by the reaction — including a raucous town-hall meeting in Ballard and an unexpected protest by construction workers — the response of many residents and business owners seemed to be, what took you so long? Amazon announced Wednesday morning that it was pausing construction of a new downtown tower until the council votes on the $75 million-a-year tax on large companies. Hours later, residents shouted down the four council members who sponsored the tax legislation at a 90-minute town hall at Ballard’s Trinity United Methodist Church. Many residents expressed general empathy for people experiencing homelessness, but lashed out at the city council — especially council member Mike O’Brien, who represents Ballard — for lax financial management and failure to address the consequences of widespread, unauthorized tent camps. O’Brien declined to comment on the meeting Thursday. Bruce Miller, a Seattle resident since 1971, said he traditionally supported tax levies, but no longer will. “I feel like city government doesn’t understand and respect taxpayer dollars, and doesn’t take responsibility for them,” said Miller, to applause. The crowd aggressively heckled the council, the event moderators and the occasional person who spoke in favor of the head tax, drawing rebukes. The crowd erupted in the strongest applause for speakers who demanded more cleanups of the estimated 400 unsanctioned homeless-tent camps citywide. “Your policies and what we’re doing in this city has unleashed chaos and crime on law-abiding people,” said one speaker. One city staffer who attended the meeting, but asked not to be named, said the anger and incivility in the room was shocking. Many council members were still reeling from the event a day later. “That did not feel like Seattle,” the staffer said. Council member Lisa Herbold said she anticipated fierce public reaction at the meeting. She thinks the council needs to do a better job of connecting the dots between the city’s economic boom and its skyrocketing housing costs. “We are unable to keep up with the need that is being created by this really hot competition for housing,” she said. Even as more people get housing, more people are becoming homeless, and residents see no change in the problem, she said. 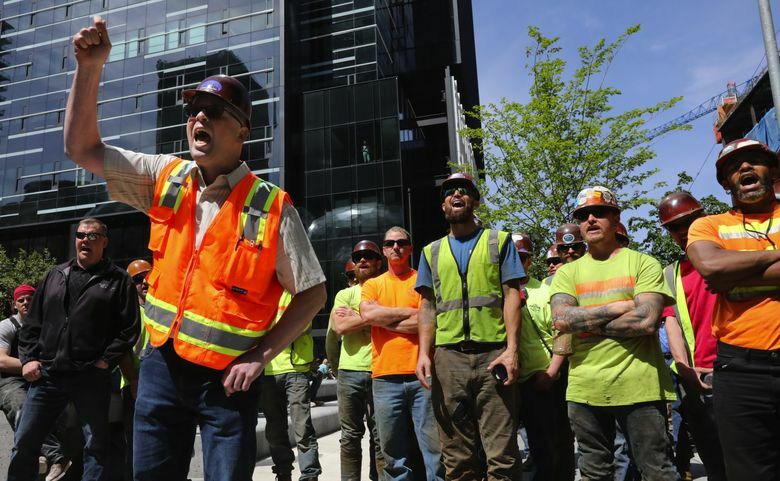 The debate over the tax took another turn Thursday when members of the Iron Workers Local 86 crashed and took over a rally planned by Councilmember Kshama Sawant. Sawant’s rally Thursday, in front of the glass Amazon Spheres, was surreal for an elected official known for her ability to get her vocal supporters to turn out at council meetings and take them over. This time, the iron workers drowned out Sawant and easily outnumbered her supporters. 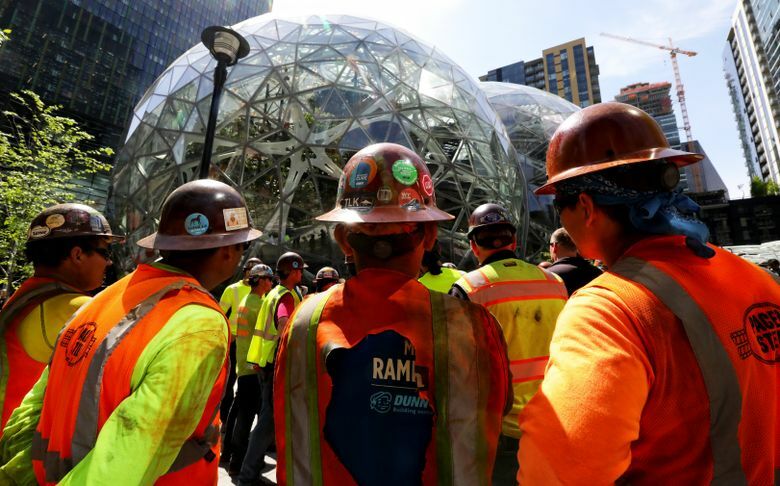 Every time she tried to speak, the workers shouted, “No head tax, no head tax!” Their yells echoed off the nearby Amazon towers, which many of the iron workers had helped to build, as downtown professionals and tourists looked on in confusion. Sawant, a socialist with strong ties to labor, tried to calm them down, referring to them as her “brothers,” but they yelled over her. “To reduce the jobs only increases the possibility of additional homelessness,” said Chris McClain, business manager for the union chapter, which has about 2,600 members. When Local 86 member Logan Swan spoke in favor of the head tax, the other iron workers at the rally turned their backs on him. The current version of the tax, which has not yet passed out of a council committee, is expected to raise $75 million a year from about 600 businesses citywide. Of that, $50 million would go to affordable housing construction, $20 million to homeless services and $5 million to city administrative costs. The council members who sponsored the legislation — O’Brien, Herbold, M. Lorena González and Teresa Mosqueda — have unveiled a spending plan, but that is subject to change, either by amendments from other council members or, more likely, during the city budget process in the fall. Among the possible options for the homeless-services portion of the money: 100 new tiny homes in two authorized encampments; 362 new beds in emergency shelters; and 97 parking spaces for people living in their vehicles. The region’s homeless population has increased significantly in the 30 months since Seattle and King County declared states of emergency; the number of people sleeping outside has doubled since 2014 according to snapshot counts of homelessness. Supporters of the tax have pointed to extensive waiting lists for homeless services, especially for subsidized housing. Emergency shelter beds for single adults were full 90 percent of the time last year, according to data from All Home King County. To get people out of shelters, King County and Seattle maintain a triage system, called Coordinated Entry for All, which screens and prioritizes people for services. In December 2017, there were nearly 8,700 people on the waiting list, including 2,118 families, and people waited more than five months on average to get a housing referral. That is in part because King County has 11,238 beds of permanent and transitional housing projects, and rapid rehousing vouchers, but just 10 percent become vacant each year, according to data in a new report by King County’s independent auditor. Seattle’s proposed head tax is estimated by council staff to create about 1,700 more units of housing, but it would take least two or three years to design and build them. 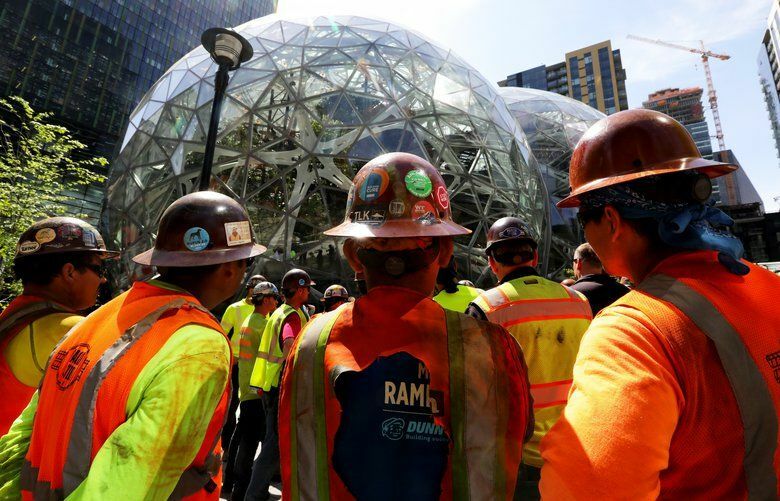 Seattle Mayor Jenny Durkan has not said whether she will veto the tax if it passes the council, but has expressed concern about Amazon’s opposition. In a meeting with The Seattle Times editorial board Thursday, Durkan said she is weighing input from different constituencies. Councilmember Sally Bagshaw signaled she might be open to delaying the planned May 14 vote on the tax. In seeking a compromise, a cooler conversation is needed, the mayor said. “The only way we get there is we actually quit some of the hyperbole, quit only the heated rhetoric and bring people together and say, ‘What are those mutual goals and aspirations we have and how do we move toward them?’ ” she said. Vianna Davila: 206-652-6550 or vdavila@seattletimes.com; on Twitter @ViannaDavila. Staff writers Jonathan Martin and Daniel Beekman contributed to this report.